Another Democrat stoops to inflammatory rhetoric and provocative imagery associated with race hatred to score cheap political points with his frothing progressive followers. 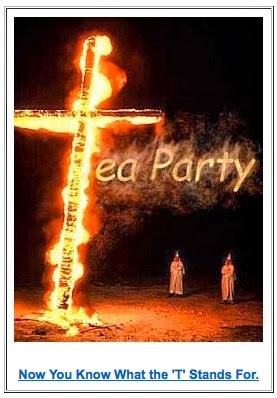 Congressman Alan Grayson (D-FL) compares the Tea Party to the KKK in word and image. The image to the left was included in a Grayson campaign email to supporters. Guys like Grayson don't want a united America in the traditional sense. They use intimidation and vilification in seeking an America with an engineered conformity they can rule over.